We supply coated or uncoated, plain or embossed krafts with good strength and durability. These are available from inventory in 45# to 78# basis weight, as well as in special coated and embossed beater dyed board to 24 point. For additional protection, film laminating may be the answer. Crisp and clean presentation makes a lasting impression. 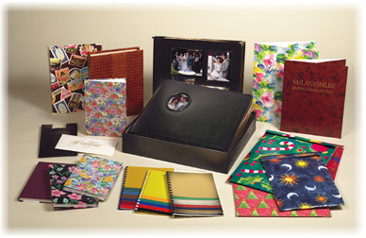 Gift certificates, travel folders, menu covers, and annual report covers are just a few of the products converted from our specialty papers and decorative board.